Amazon says it will pay all its U.S. workers at least $15 an hour. Here, workers prepare shipments at an Amazon Fulfillment Center in California during the early Christmas rush in 2014. "We listened to our critics, thought hard about what we wanted to do, and decided we want to lead," said Amazon's founder and CEO Jeff Bezos, as the company announced the new pay scale Tuesday. "We're excited about this change and encourage our competitors and other large employers to join us." In addition to committing to higher minimum pay, Amazon says it will push Washington, D.C., policymakers for a higher federal minimum wage. Dave Clark, Amazon's senior vice president of worldwide operations, told NPR that the company believes $7.25 is too low for a federal minimum wage, though it's not specifically advocating for $15. "We think it's up to Congress and the experts to decide what it should be," he said. "But we think it should be higher." Clark said Amazon's current hourly pay for temporary warehouse workers varies by region, from just under $11 to more than $15. In another change, Amazon will phase out its Restricted Stock Unit program for order fulfillment and customer service employees who are paid hourly. Those workers currently receive shares of stock if they meet certain conditions. But the company says the employees have said, "They prefer the predictability and immediacy of cash to RSUs." For those hourly workers, Amazon plans to replace its RSU grant program with a direct stock purchase plan by the end of 2019. The net effect, the company says, will mean "significantly more total compensation" for the workers. At the new pay rate, an Amazon employee who makes the new minimum wage would need to work more than three weeks (133 hours) to buy one share of the company's stock, which currently sits above $2,000. And that's before taxes and other expenses are taken into account. The corporation revealed its median pay this past spring, under a new law that requires companies to report the earnings gap between their CEOs and their regular workers. As Bloomberg News reported in April, "Amazon is now the second-largest private employer in the U.S. behind Walmart Inc."
After the $28,446 figure drew criticism from Sen. Bernie Sanders and others, Amazon stressed that the number reflects its employees' pay worldwide; the median salary for a full-time employee in the U.S., the company said, is $34,123 — a figure it said should be compared to salaries at other retailers. Amazon's market capitalization currently stands near $1 trillion; it paid Bezos, its founder and CEO, $1.68 million last year. But as Amazon's stock has risen, so has Bezos' net worth — it's currently estimated around $165 billion. Those gains came in the same year that a number of Amazon's employees were found to be relying on the federal Supplemental Nutrition Assistance Program — SNAP — which until recently was commonly called food stamps. That revelation came from The Intercept, which reported that in four out of the five states that provided data, Amazon was one of the top employers of SNAP recipients. Sanders called the move "an important step forward." "Our view was that it is totally absurd for the taxpayers of this country to have to subsidize the wealthiest guy on Earth who is paying his employees wages that are so low that many of them are forced to go on Medicaid, food stamps, and other government programs. They denied that, they argued with us," the Vermont senator told NPR on Tuesday. "But at the end of the day what I have to say is, I have to give credit where credit is due. And that is that Mr. Bezos today did the right thing." Sanders predicted that other companies including Wal-Mart and McDonald's would follow suit by raising wages. But David Autor, a professor and labor economist at MIT, tells NPR he thinks it's too early to declare victory on that front. "I think it will increase pressure on other large employers to take similar steps," Autor said. He adds that the wage hike won't be "the domino that knocked over the entire rack of dominoes." Nonetheless, he said, "No matter how cynically one wants to interpret it, it's still good news." "It will be felt by the individuals who receive it," Autor said. "It will increase their standards of living allow them to pay for transportation, for food, for housing, for education and stuff for their kids. Low-wage workers in America are low-paid by the standards of high income developed countries." 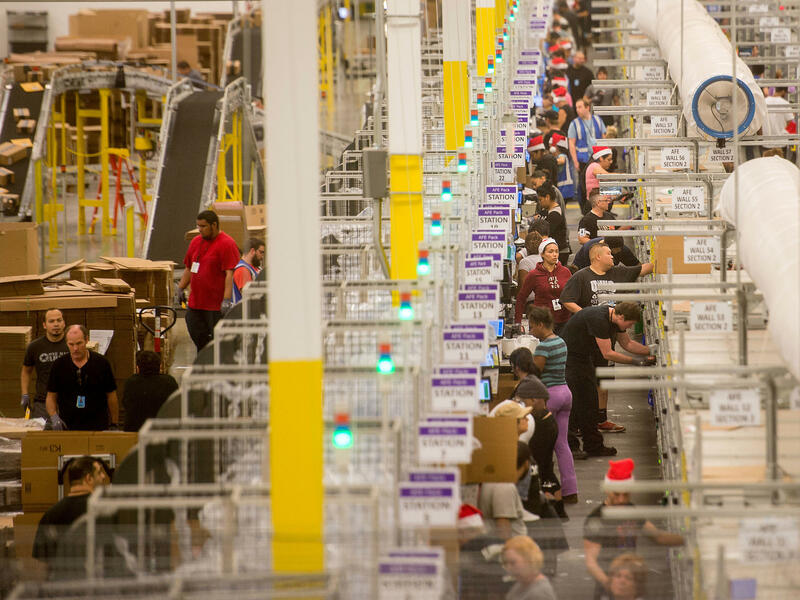 The new minimum wage for Amazon workers far exceeds the $7.25 federal minimum pay; Amazon says it will set the mark for more than 250,000 current employees, as well as more than 100,000 seasonal employees it plans to hire for the coming holiday season. The federally mandated minimum pay hasn't risen since 2009. And in that time, the rate "has lost about 9.6 percent of its purchasing power to inflation," the Pew Research Center said last year. From state to state, the minimum wage varies widely. In 29 states and Washington, D.C., it's higher than the federal rate. But in two states (Georgia and Wyoming), it's lower, at $5.15. And five states have laws that don't require a minimum wage at all, according to the Department of Labor. Amazon's new pay rate includes workers who are hired through temp agencies and subsidiaries in the U.S. The company has more than 575,000 employees worldwide. NPR Business Correspondent Alina Selyukh contributed to this report.